Our atmosphere contains varying amounts of tiny liquid or solid particles called aerosols. Some aerosols have a natural origin, like the mineral dust particles that form sandstorms, or the sea spray emitted by breaking waves. Other aerosols are due to human activities, from the combustion of fossil fuels to generate electricity or power our transport systems, to agricultural and forest clearing fires. Aerosols play an important role in the formation of liquid clouds. To form a liquid cloud droplet in normal atmospheric conditions, water vapour needs to condense on to aerosols. Human activities or sporadic natural sources like wild fires and volcanoes increase the number of aerosols in the atmosphere. Cloud water ends up being distributed over more aerosols, leading to the formation of more, smaller liquid cloud droplets. Distinguishing polluted from unpolluted clouds is generally not possible with the naked eye. But using satellite instruments that measure in the near-infrared part of the electromagnetic spectrum reveals the impact human activities and natural sources have on clouds. In the near-infrared, clouds made up of smaller droplets appear brighter than clouds made up of larger droplets. 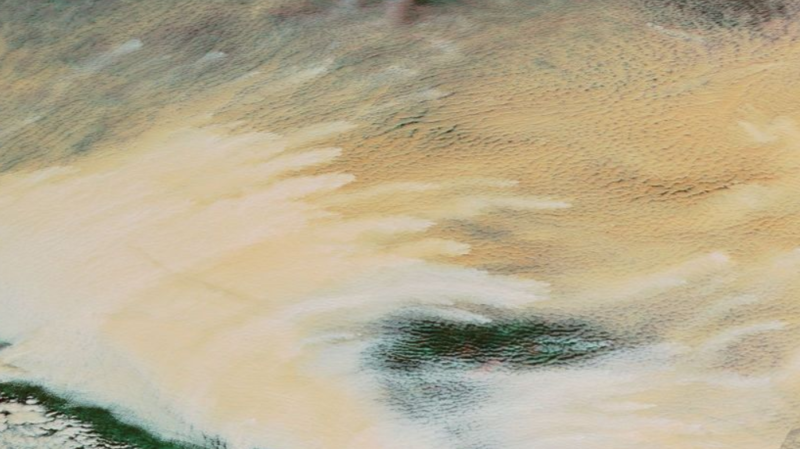 The following image is a true colour image taken by a NASA satellite instrument called the Moderate Resolution Imaging Spectroradiometer (MODIS). We are over Vanavara in Central Russia, on 8 October 2016. The clouds on the western side of the picture are clearly brighter than the clouds on the eastern side, but why? Are they simply thicker? Or have their droplets been made smaller by aerosol emissions? Looking at the same region, but this time using a near-infrared wavelength, brings the answer. Clouds appearing white on the picture are brighter because they are made of smaller droplets than the clouds that appear orange. The linear structure of the brighter clouds betrays discrete sources of aerosols: in this case, wild fires raging in the Siberian forest. Still over Russia, but on 29 June 2010 this time. The true colour image appears unexciting. But the same scene observed in the near-infrared reveals a long, narrow strip of clouds that are brighter, hence made of smaller droplets. What is the aerosol source in this case? A refinery of the Vankor Oil field in Eastern Siberia. Moving to warmer climes and a different type of clouds. 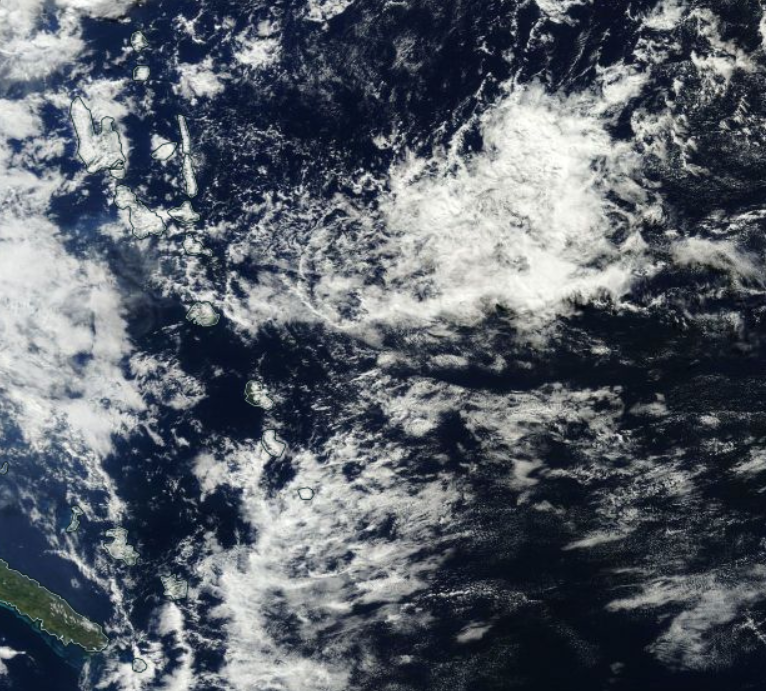 We are now in the Pacific Ocean, on 6 July 2016, looking at the islands forming Vanuatu, and at cumulus clouds. The true colour image appears again rather unremarkable. But looking in the near-infrared reveals polluted clouds, which are more difficult to identify in such broken cloud conditions. For that reason, they have been marked by the yellow arrows. Human activities are not the cause of the smaller droplets in this case. 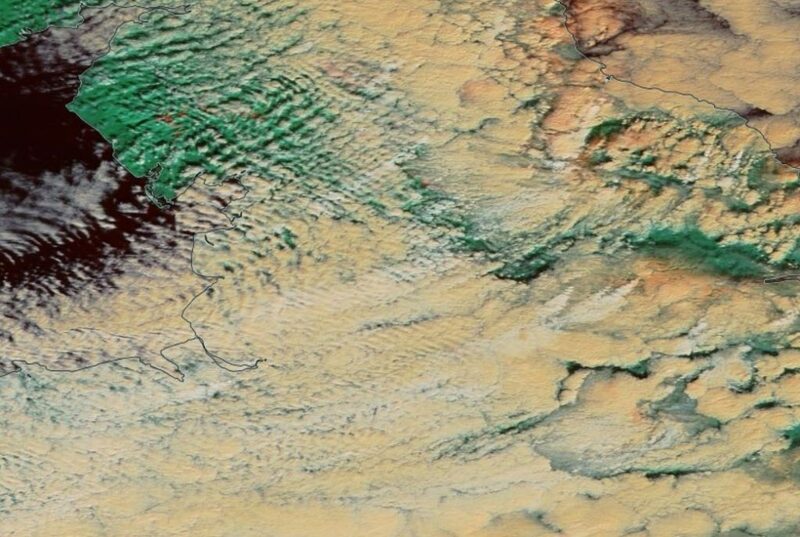 The perturbations are caused by two volcanoes, Ambrym and Yasur, degassing sulphur-rich aerosols into the atmosphere. Closer to home, now. 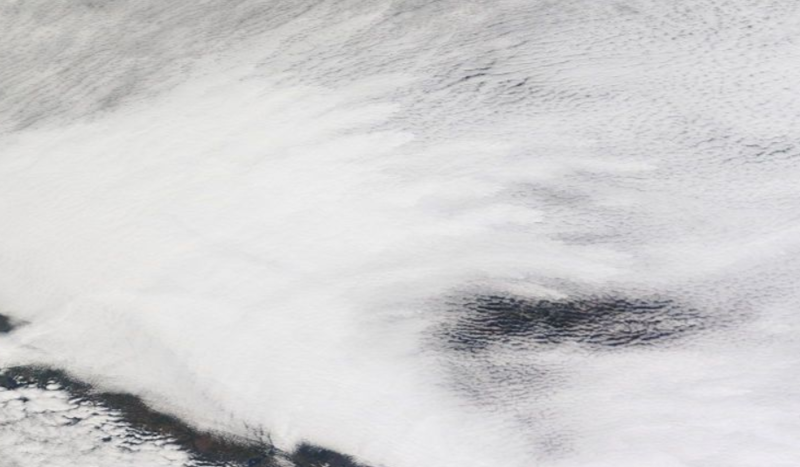 The following image, taken on 1 March 2013, shows cold, pristine air blowing from Scandinavia into northern England. But look in the near-infrared and suddenly the locations of power stations, which inject aerosols emitted from the burning of oil and coal, appear clearly. Those images are not just beautiful to look at. Because a brighter cloud reflects more sunlight back to space, man-made aerosols indirectly modify the energy budget of the Earth through their modification of cloud droplet sizes. By identifying and studying hundreds of those “cloud tracks”, my colleague Dr Velle Toll and I have extracted quantitative information about the response of clouds to aerosol emissions by human activities. With our dataset, we can determine if cloud responses simulated by climate models are realistic. Our research will hopefully lead to improved representations of aerosol-cloud interactions in climate models, which are used to predict future climate changes. This entry was posted in Aerosols, Atmospheric chemistry, earth observation, Remote sensing. Bookmark the permalink.